Crouching out of sight on a high tree branch in the form of a leopard, a human peers out of the jungle at the strange construction of a temple of Evil Elemental Air, keeping a close eye on the cultists’ activities. Swinging a blade formed of pure fire, a half-elf charges into a mass of skeletal soldiers, sundering the unnatural magic that gives the foul creatures the mocking semblance of life. Whether calling on the elemental forces of nature or emulating the creatures of the animal world, druids are an embodiment of nature’s resilience, cunning, and fury. They claim no mastery over nature. Instead, they see themselves as extensions of nature’s indomitable will. Druids revere nature above all, gaining their spells and other magical powers either from the force of nature itself or from a nature deity. Many druids pursue a mystic spirituality of transcendent union with nature rather than devotion to a divine entity, while others serve gods of wild nature, animals, or elemental forces. The ancient druidic traditions are sometimes called the Old Faith, in contrast to the worship of gods in temples and shrines. Druid spells are oriented toward nature and animals—the power of tooth and claw, of sun and moon, of fire and storm. Druids also gain the ability to take on animal forms, and some druids make a particular study of this practice, even to the point where they prefer animal form to their natural form. For druids, nature exists in a precarious balance. The four elements that make up a world—air, earth, fire, and water—must remain in equilibrium. If one element were to gain power over the others, the world could be destroyed, drawn into one of the elemental planes and broken apart into its component elements. Thus, druids oppose cults of Elemental Evil and others who promote one element to the exclusion of others. Druids are also concerned with the delicate ecological balance that sustains plant and animal life, and the need for civilized folk to live in harmony with nature, not in opposition to it. Druids accept that which is cruel in nature, and they hate that which is unnatural, including aberrations (such as beholders and mind flayers) and undead (such as zombies and vampires). Druids sometimes lead raids against such creatures, especially when the monsters encroach on the druids’ territory. Druids are often found guarding sacred sites or watching over regions of unspoiled nature. But when a significant danger arises, threatening nature’s balance or the lands they protect, druids take on a more active role in combating the threat, as adventurers. When making a druid, consider why your character has such a close bond with nature. Perhaps your character lives in a society where the Old Faith still thrives, or was raised by a druid after being abandoned in the depths of a forest. Perhaps your character had a dramatic encounter with the spirits of nature, coming face to face with a giant eagle or dire wolf and surviving the experience. Maybe your character was born during an epic storm or a volcanic eruption, which was interpreted as a sign that becoming a druid was part of your character’s destiny. Have you always been an adventurer as part of your druidic calling, or did you first spend time as a caretaker of a sacred grove or spring? Perhaps your homeland was befouled by evil, and you took up an adventuring life in hopes of finding a new home or purpose. You can make a druid quickly by following these suggestions. First, Wisdom should be your highest ability score, followed by Constitution. Second, choose the hermit background. Some druids venerate the forces of nature themselves, but most druids are devoted to one of the many nature deities worshiped in the multiverse (the lists of gods in appendix B include many such deities). The worship of these deities is often considered a more ancient tradition than the faiths of clerics and urbanized peoples. In fact, in the world of Greyhawk, the druidic faith is called the Old Faith, and it claims many adherents among farmers, foresters, fishers, and others who live closely with nature. This tradition includes the worship of Nature as a primal force beyond personification, but also encompasses the worship of Beory, the Oerth Mother, as well as devotees of Obad-Hai, Ehlonna, and Ulaa. In the worlds of Greyhawk and the Forgotten Realms, druidic circles are not usually connected to the faith of a single nature deity. 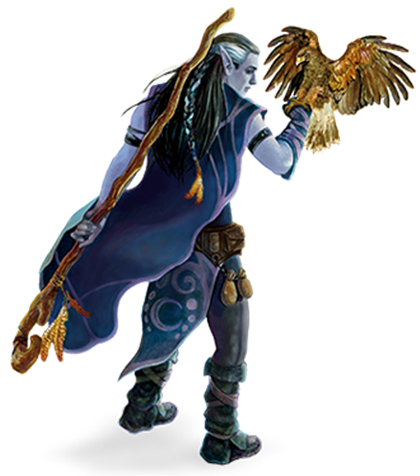 Any given circle in the Forgotten Realms, for example, might include druids who revere Silvanus, Mielikki, Eldath, Chauntea, or even the harsh Gods of Fury: Talos, Malar, Auril, and Umberlee. These nature gods are often called the First Circle, the first among the druids, and most druids count them all (even the violent ones) as worthy of veneration. The druids of Eberron hold animistic beliefs completely unconnected to the Sovereign Host, the Dark Six, or any of the other religions of the world. They believe that every living thing and every natural phenomenon—sun, moon, wind, fire, and the world itself—has a spirit. Their spells, then, are a means to communicate with and command these spirits. Different druidic sects, though, hold different philosophies about the proper relationship of these spirits to each other and to the forces of civilization. The Ashbound, for example, believe that arcane magic is an abomination against nature, the Children of Winter venerate the forces of death, and the Gatekeepers preserve ancient traditions meant to protect the world from the incursion of aberrations. You know Druidic, the secret language of druids. You can speak the language and use it to leave hidden messages. You and others who know this language automatically spot such a message. Others spot the message’s presence with a successful DC 15 Wisdom (Perception) check but can’t decipher it without magic. Drawing on the divine essence of nature itself, you can cast spells to shape that essence to your will. See Spells Rules for the general rules of spellcasting and the Spells Listing for the druid spell list. The Druid table shows how many spell slots you have to cast your druid spells of 1st level and higher. To cast one of these druid spells, you must expend a slot of the spell’s level or higher. You regain all expended spell slots when you finish a long rest. For example, if you are a 3rd-level druid, you have four 1st-level and two 2nd-level spell slots. With a Wisdom of 16, your list of prepared spells can include six spells of 1st or 2nd level, in any combination. If you prepare the 1st-level spell cure wounds, you can cast it using a 1st-level or 2nd-level slot. Casting the spell doesn’t remove it from your list of prepared spells. You can use a druidic focus (see the Adventuring Gear section) as a spellcasting focus for your druid spells. You choose whether your equipment falls to the ground in your space, merges into your new form, or is worn by it. Worn equipment functions as normal, but the DM decides whether it is practical for the new form to wear a piece of equipment, based on the creature’s shape and size. Your equipment doesn’t change size or shape to match the new form, and any equipment that the new form can’t wear must either fall to the ground or merge with it. Equipment that merges with the form has no effect until you leave the form. At 2nd level, you choose to identify with a circle of druids: the Circle of the Land detailed at the end of the class description or one from the Player's Handbook or other sources. Your choice grants you features at 2nd level and again at 6th, 10th, and 14th level. At 4th level, you can use your action to magically assume the shape of a beast that you have seen before of challenge rating 1/2 or lower that doesn't have a flying speed. You can use this feature twice. You regain expended uses when you finish a short or long rest. At 8th level, you can use your action to magically assume the shape of a beast that you have seen before of challenge rating 1 or lower. You can use this feature twice. You regain expended uses when you finish a short or long rest. Though their organization is invisible to most outsiders, druids are part of a society that spans the land, ignoring political borders. All druids are nominally members of this druidic society, though some individuals are so isolated that they have never seen any high-ranking members of the society or participated in druidic gatherings. Druids recognize each other as brothers and sisters. Like creatures of the wilderness, however, druids sometimes compete with or even prey on each other. At a local scale, druids are organized into circles that share certain perspectives on nature, balance, and the way of the druid. For example, when you are a 4th-level druid, you can recover up to two levels worth of spell slots. You can recover either a 2nd-level slot or two 1st-level slots. Your mystical connection to the land infuses you with the ability to cast certain spells. At 3rd, 5th, 7th, and 9th level you gain access to circle spells connected to the land where you became a druid. Choose that land — arctic, coast, desert, forest, grassland, mountain, swamp, or Underdark — and consult the associated list of spells. In addition, you have advantage on saving throws against plants that are magically created or manipulated to impede movement, such those created by the entangle spell. What ever happened to Circle of the moon? Circle of Land is the only Druid Circle included in the free Basic Rules (Basic Rules, SRD, EEPC). Any official content not made available in a free source from WotC must be unlocked by a purchase in the Marketplace (either by you or by another account via a campaign with content sharing enabled). Circle of the Moon is in the Player's Handbook. I wish that the Circle of Dreams had spells memorized like the Circle of Land does, it feels underwhelming in comparison. Contrarily to the spells granted by the Circle of the Land, the spells granted by the Circle of Dreams do not seem to spend your spell slots, making for a more versatile support character. Especially outside of combat. However, I would have wished the Walker in Dreams feature did not have the condition that requires it to be used immediately after a short rest. You need to own the sourcebook for any druid circles not included in the basic rules, which is just the circle of land. Hey Guys, i was wondering why the circle of the moon is not in here? I have a character that uses that, and it is not on the list. any ideas? So, If we purchase the Players handbook through DnD Beyond, we'll have access to Circle of the Moon? Yes, the PHB gives access to Circle of the Moon. I wish there was a way to have credit for the books that we already own. I already have the PHB. I don't really want to purchase it again to get the "digital" copy. That's so dirty. And costs as much as an add-on item like Xanathar's. I have the Players Handbook, but not having access here to parts of it... It's just filthy business imo. you can buy indivial items for 1.99, i do this for books i already own . This is a confusing example to new players. First, new players aren't familiar with how a Wisdom of 16 relates to the Wisdom Modifier used to calculate the total number of prepared spells. Why not specify the wisdom modifier here instead of the wisdom? It's just unnecessarily confusing. Also, picking a level that ends up with 6 prepared spells--which is also the exact number of spell slots available at that level further opens the door to confusion. A smart example would have 1.) used a character level that had more (or less) prepared spells than spell slots to differentiate the concepts and 2.) specified the Wisdom Modifier instead of the Wisdom to make it clear how that prepared spell number was derived. Is there a way to add the beasts I can wild shape into on the character sheet online and provide all their stats? EDIT: Just noticed the Creature section update. Super stoked! where is the circle of the moon? Thank you for getting to the heart of the matter.